I love autumn, but truthfully, I’m not ready for it. Luckily, the Vancouver weather is on my side because we’re having a lovely extended summer – no rain for the foreseeable future and lots of sunshine and warm temperatures. The wooly cardigans are shoved deep into the back of the closet and I intend to keep them there for the time being. Right now, I’ve got sandals on my feet but I’m willing to give a nod to the season in my breakfast bowl. That granola up there? It’s my concession to fall. There’s organic pumpkin puree mixed with maple syrup and heady with pumpkin pie spice. It’s crunchier than the leaves that will surely be underfoot in a month or two and a bowl on a Monday morning will ease you nicely into the week ahead. Topped with greek yogurt and alongside a strong coffee, there’s nothing better. 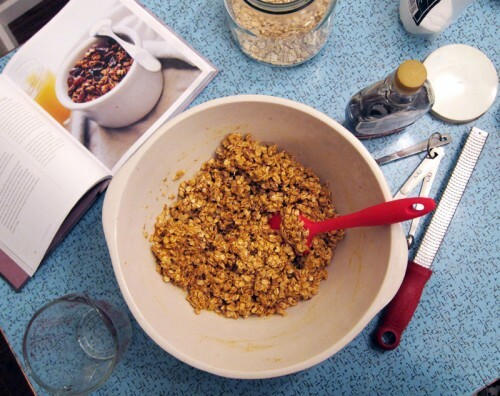 This delightful recipe comes from The Sprouted Kitchen cookbook and while the original version makes 3 cups worth, I doubled it to make 6 cups because I love having granola on hand for busy mornings. Generally when I make granola, I start with the dry ingredients and then add the wet ingredients to the bowl before mixing. This recipe takes the opposite tack, and for good reason. The olive oil, spices, maple syrup and pumpkin puree need to be whisked well in order to blend into a smooth consistency – especially if you use a canned organic pumpkin which tends to be a bit drier than the major brands. The original recipe calls for sesame seeds and while I could have sworn that I had some black sesame seeds in the cupboard, my search left me empty handed. I also subbed in walnuts for pecans because it’s what I had on hand, though I think pumpkin seeds would have been a nice addition too. The whole shebang gets toasted in an oven until golden and crisp and permeates the kitchen with that spicy, sweet smell that definitely brings the boys in from the yard. This really is a wonderful collection of wholesome and creative recipes. 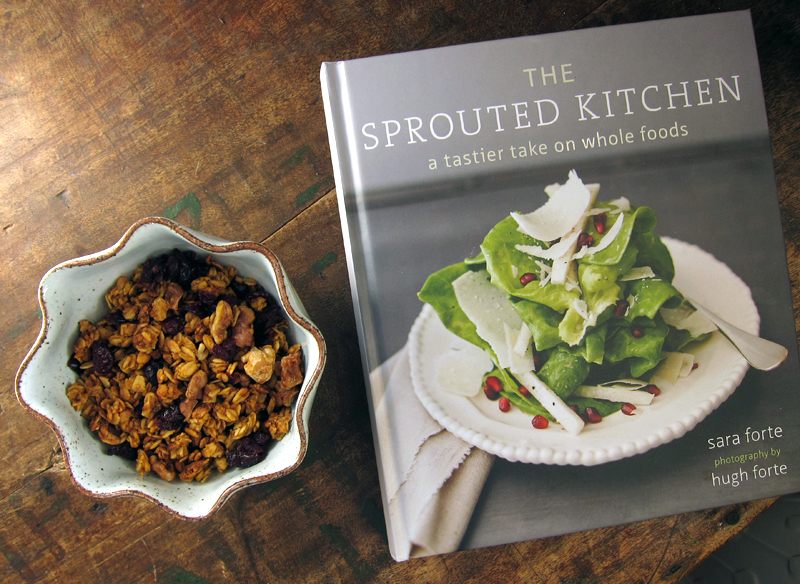 I’ve been a fan of the Sprouted Kitchen blog since it began, but this book is worthy of an easily reachable place on your shelf. When I received it late last week, I dog-eared many of the 100 recipes: the greek grilled chicken with tzatziki, the coconut lime tart, the honey almond butter, and the harvest buckwheat tart to name a few. The ingredients are familiar and the instructions are straightforward and simple – friendly enough for your own personal adaptations and twists. Plus, it’s gorgeous to look at! This cookbook is worthy of all the accolades it has been getting and should be on your must-have cookbook list. And while I received a copy of this book from the publisher (10 Speed Press), the enthusiasm and excitement is all mine. elsewhere: Want time to stand still for just a moment? Then let this simple egg sandwich take you away. Get the recipe over at Poppytalk. If you don’t have pumpkin pie spice on hand, you can easily blend together some freshly grated cinnamon, ginger, nutmeg, allspice and cloves (or some combination there of) to get that same autumn flavour. In a large mixing bowl combine the olive oil, salt, pumpkin pie spice, maple syrup and pumpkin puree and whisk well to blend until smooth. Add in the oats and walnuts and stir until well coated. Line a walled cookie sheet with parchment paper and spread the mixture evenly. Bake until dry and golden in colour, about 35 minutes or so, stirring every 10 minutes to push the outside bits to the inside & viceversa. You will see the steam escape while pushing the granola around & this is key to keeping the granola crisp. Add in raisins/cranberries/cherries and toss to mix. Cool completely before storing in a tightly lidded container. Makes about 6 cups. I know you’re still hanging onto summer but this post had a wonderful warm sweater feel to it. yum! i LOVE granola, and i’ve always wanted to make one that used pumpkin puree. what a perfect breakfast! 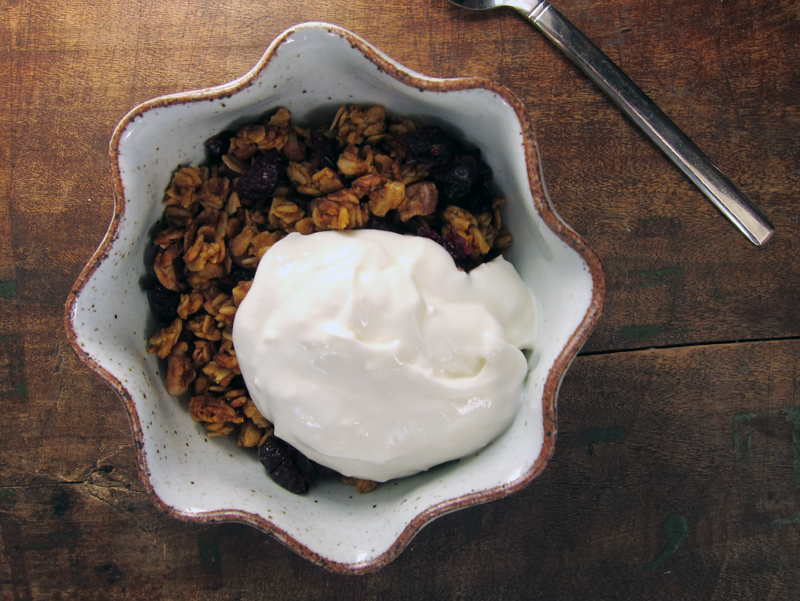 There is nothing I love more for breakfast than a bowl of yogurt and homemade granola. And I can’t think of a better way to slowly ease into Fall, whether we like it or not. (But for the record, I love it). I love the idea of putting pumpkin puree in granola — I’ll have to try it when the pumpkins roll in. Our light and our air say it is fall now here in Northern California. I made this using pecans, freshly roasted pumpkin, and raisins. A great taste for fall, but I think I’d dial down the maple syrup to maybe a 1/2 cup next time. On an unrelated note, have you considered adding a print widget to ELS that only prints the recipe? The current widget results in 5 or 6 sheets being printed, and I’ve found that highlighting the recipe + “print selection” has never worked very well (I’m currently using Firefox v. 15) on ELS. I made a pumpkin granola a couple years ago and it was awesome. This one looks delightful! And that looks like such a beautiful book! Thanks Tracy, I take that as a compliment. I think it’s just talking about pumpkin and spice that makes it feel like fall. And maybe the lighting! Karen, get to it. Sooooo good! Amanda, agreed – but I like a slow easement since summer didn’t take until August here. Thanks Nicole, it’s so perfect for breakfast. I love it. The pumpkin puree works really well here. Enjoy! 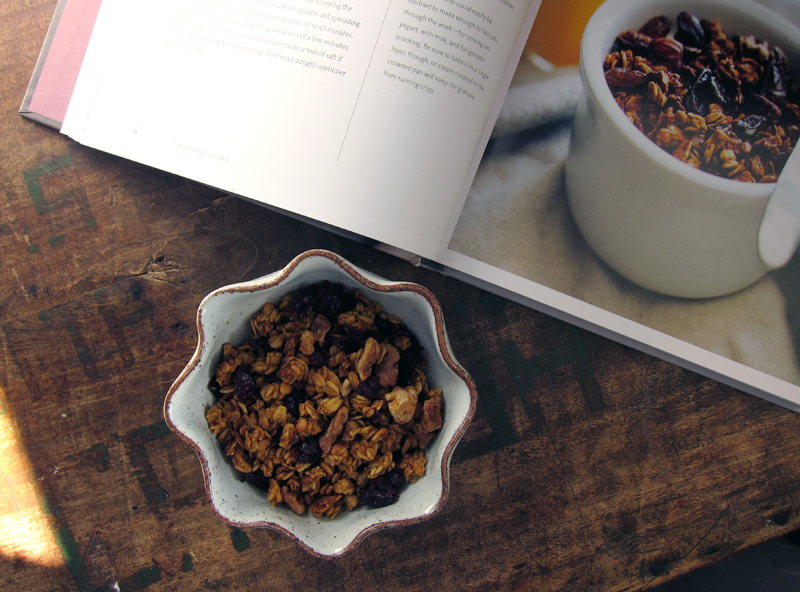 Robert, so glad you liked the granola – I’ll be making it again, definitely. And yes, putting a print feature has been the top priority that just gets forgotten about. But hopefully by the end of the year!! Fingers crossed. Thanks Sues, it’s a keeper, as is the book. I am loving Sara’s book and I’m a granola fiend myself (I am never without!). The weather has been fickle in SF, but in my head, I’m ready for fall…and pumpkin! I am excited to try this! Lazy me just buys her granola cereal at $7.50 a box – gah!! There’s no excuse, I have all the above ingredients in my cupboard – except the pumpkin spice – so I really need to get my act together and make this, right? Joanne, make your own pumpkin pie spice (that’s what I did!!). Yes, make this please, it’s a keeper. I just made this again. I was wrong about reducing the maple syrup, it’s fine as written. 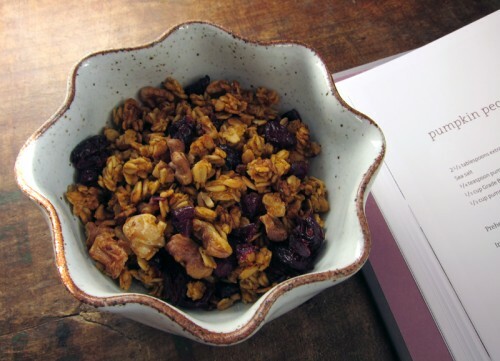 I’ve made three or four of your granola recipes, and I think this one is my favorite. I used golden raisins, pecans, and also skipped the sesame seeds, that flavor wouldn’t make sense to me here. Your process produces the all-important “chunks”. I would have thought olive oil was too cloying, but it works. Also, I think it’s important NOT to use a silpat for granola baking, the silicon barrier seems to cause moisture to be retained and I had to bake this for 10 minutes more to make it sufficiently crunchy. I just made this! I had a lonely half butternut in the vegie drawer so I boiled it and put it through a food mill. 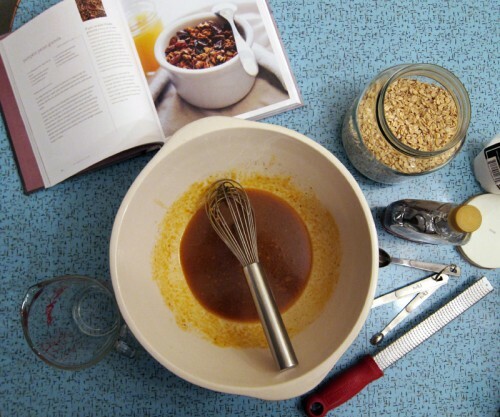 I used almonds, added pumpkin seeds and zested an orange into the wet mix – yum! Perfect with the cranberries! Thank you! Glad you enjoyed it, Robert! It’s surprising at how well olive oil works in granola recipes and good tip about the silpat – I did use parchment this time. However I have used silpat in the past with no weird moisture issues. Maybe it was the pumpkin. I am just about to make this! But I was wondering..how long do you think this lasts? Do you think this would go bad more quickly than other granolas because of the pumpkin in it? Chelsey – No, I think it should last a few weeks. It only lasted a few days here but it was totally crispy throughout. Just make sure you keep it in a tightly sealed jar.